Here are some gift ideas for dad when he says he doesn’t want anything for Christmas. He’s lying. He wants stuff, he just doesn’t know everything that’s out there. That’s where you come in and give him something awesome he didn’t even know about. The next time you want to improve the odds that dad will save up for your college fund instead of his next Vegas trip, get him this decision bank. It puts the odds at 50/50 and takes the decision out of his hands. This handy tool fits right in his wallet next to his credit cards. It’s small enough that he can take it anywhere he goes, but still very useful because of the array of tools it provides, including a knife and screwdrivers. Even though dad might say he doesn’t want anything for Christmas, every dad will love this Major Award. It fashioned to be an exact replica of the lamp from Christmas Story, and even lights up just like it does in the movie. If dad has never tried a pizza cone before, he doesn’t know what he’s missing. The crust forms the cone, and all of the delicious pizza toppings are swimming inside in a gooey ball of cheese. It’s a very tasty and handy food creation. Keep dad busy for awhile with this coloring book that bills itself as an expert level coloring book. It’s not exactly the easiest thing to stay within the lines on this one, so be sure to get him a pack of colored pencils with this so he can fine tune things. Ties are one of those passe gifts that have been given since the dawn of modern times, but you can give it a new twist by getting dad this glow tie to add to his collection. In the light it looks like any other tie, but with the lights off it glows like crazy. Don’t make dad settle for a regular old boring coat hook or coat rack. Get him these ninja star coat hooks and he’ll look like a black-cloaked assassin as he grabs his coat on his way out and reveals a ninja star stuck in the wall. Dad can take a page out of Barney’s diary with this suit pajamas. When he goes to sleep he can “suit up!” in a pair of pajamas that look like they were made by Armani. The perfect Christmas gift for dads that are fans of How I Met Your Mother. If dad likes a good drinking game it doesn’t get much more basic than Spin the Shot. It’s a bit like spin the bottle but with drinking instead of kissing. Place a shot, spin the arrow, and whoever it lands on is the lucky or unlucky contestant. This showerhead changes colors to give dad a unique showering experience. It’s one of those gifts that he probably didn’t know he wanted, and probably didn’t know they made, but once he sees it and uses it he’ll be glad he has it. This brownie maker makes a string of brownies, all with the perfect crust to them. It’s like everybody gets an edge or corner piece, so dad doesn’t have to fight for the brownies that are his favorite. Make a batch of Christmas brownies with this. 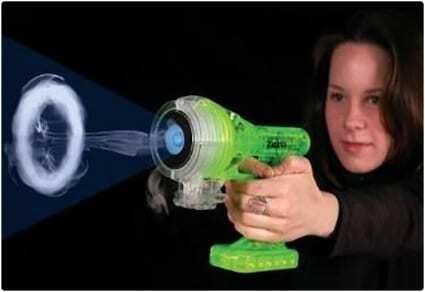 Dad will have fun blasting vapor rings up to 20 feet with this vapor blaster. If he can’t think of what he wants for Christmas, maybe he already has all of the things he wants. But chances are he hasn’t seen one of these before. It’s not so much the cookie bowl maker that you’re getting dad when you get him this, but the amazing ice cream served in a cookie bowl that he’s going to go gaga for. After he finishes eating the ice cream he gets to eat the bowl too! Dad will be a little more specific next year when you ask him what he wants for Christmas when you get him this remote control flying shark. It’s not every day you see a shark flying around, and this is just a fun and zany gift he’ll actually like. Keep dad’s grill in use this spring and summer with these Grill Grates. They raise up the food so that they don’t get charred by flare ups, and they’re much easier to clean than a regular grill rack. Food comes off the grill easily with the special spatula it comes with. This is one gift that dad will either use as intended, or wonder what you were thinking when you got it. You have to know what sort of personality your dad has to make this gift a success, but choose wisely and he’ll crack up and then start putting it to good use. Help make sure dad is awake in the morning by getting him this target alarm clock as a Christmas gift. No snooze buttons here, you have to be awake and alert enough to hit the target, so he might as well get out of bed once he’s awake. The ham dogger is like eating a hot dog that’s made out of ground beef. It’s easier to hold than a hamburger, but beefy like a burger. Top it the same way you’d top a burger or a hot dog, and use a hot dog bun instead of a burger bun. The next time dad has a poker night with his buddies he’s going to love showing off these gold-plated playing cards. They come with a certificate of authenticity and everything, so it’s real gold, and they’ll last and last for years. Give dad his own stash of cookies and pay homage to his moustache all in one gift. When you make this cookie jar, it’s all about dad. You can put his favorite cookies in it to make it extra special and personalized. Give dad a sixe pack of well-dressed beers with this bow tie tutorial. Works with beer or those fancy IBC root beers you can find in the soda section. He’ll love getting these because they not only look good, but they taste good too. Every dad loves a nice reminder of his family, and this photo holder does a good job of it. He can place this on his desk and see an array of photos. It’s the sort of gift that shows you took the extra effort of making something he’ll really like. This bucket is the perfect gift to assemble for a dad that loves a good barbecue. It’s a bit of a tease if you live in a northern state since he probably won’t use it again until the spring, but it’s the thought that counts, right? Give dad some time to do guy things and he’ll be a better dad for it. These tickets give dad license to go out with his buddies and do what guys do, without feeling bad about it. It shows dad that you care enough to give him some guy time. This storybook tells dad’s story from the eyes of his kids, so he can see what a hero he is to them. Let them tell the story the way they see it, and then dress it up nicely as a storybook like they have done here. This jar is filled with fun things to do with dad, and the Scrabble tiles just add to the craftsy nature of the gift. You can fill it with all the things that you love to do with dad, and whenever you’re wondering what to do you just grab one and do it. These coasters are old school retro style and dad is sure to love them. Some are of Pac Man and others are of classic looking sunglasses. You can’t go wrong with these, they’ll look great in dad’s man cave.